Discovering great new writers is one of the delightful parts of being a bookseller. I’m constantly on the lookout for wonderful new fiction, and especially look for books that can be a little edgy, like Herman Koch’s “The Dinner”. I also love and recommend historical works of fiction. This is a compassionate, but no holds barred memoir about Mewshaw’s decades long friendship with Pat Conroy. It details their friendship up until Pat asked Mewshaw for a terrible favor, which when granted ended their friendship. A fascinating look into a complicated relationship. By the bestselling author of The Alice Network, this WWII thriller is a riveting account of war, revenge, and the uncompromising power of truth. It takes the reader from an all-female night bomber regiment in the Soviet Union, to a Nazi hunter in London, to an unsuspecting family in Boston. I loved it! 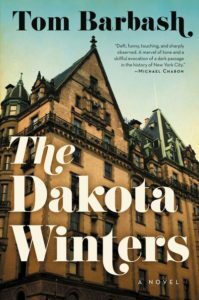 A funny, touching novel of a family living among the celebrities of the Dakota building in 1979 New York. A social commentary of a critical moment in the history of New York City in the year leading up to John Lennon’s assassination. 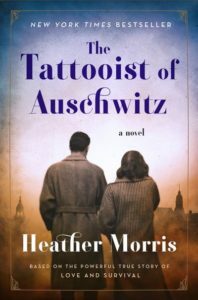 This amazing book is based on interviews that Morris conducted with Ludwig “Lale” Sokolov, an Austro-Hungarian-born Slovak-Australian Holocaust survivor sent to Auschwitz in 1942 as the concentration camp’s tetovierier. Its a story that shows the strength of love when all of humanity has forsaken you. This novel is set in the mountains of 1950’s North Carolina. It’s a wonderfully written story about folk healers, bootleggers, powerful mountain clans, and dark family secrets. An old-fashioned murder mystery reminiscent of Agatha Christie novels, based on an actual murder back in the 1920’s during the Golden Age. It was a fun read and kept me guessing to the end! This epic saga is at times incredibly funny, and achingly sad. Boyne entertains readers with a story of Ireland from the 1940’s to present day, through the eyes of a boy who knows he is gay in a society that hates his sexuality. If you love John Irving you will adore this book. I devoured it! My favorite beach read of the year! This book is the total package: the best of old Hollywood intrigue, a sensational twist you never suspect, and an eye-opening commentary on the price of female stardom. Loved it! If you loved The Nightingale you will devour this! 1944 Germany and 3 women, one of whose husband was executed for the assassination attempt on Hitler, try desperately to save other women caught in the turmoil during the end of the war. An emotionally powerful novel about friendship and survival. Loved it! Line weaves together fact and fiction to bring to life the woman behind Andrew Wyeth’s famous painting, Christina’s World. Tender and tragic. I loved it! WWII in a quiet English village as seen through the eyes of five very different women. Lives are upended and secrets unraveled as these women learn that friendship can sustain them as their world collapses around them. A terrific debut! An atmospheric debut mystery that takes place under the blistering Australian sun. A federal agent returns to his hometown to find a decades old crime influencing his investigation of a horrific new one. Tightly paced – hard to put down. A wonderful multi-generation family saga that takes place on a small island off the coast of Italy. Early 1900 to current day. Loved it! In this fictional memoir, the extraordinary life of Beryl Markham is brought to life. Raised in Kenya by her father and the native Kipsigis tribe, her unconventional childhood led to her becoming a strong, independent woman. Her failed marriage, her love affair with Deny Finch Hatton and her transatlantic flight that made her famous are all a part of the story of a woman ahead of her time in life and love. Set in the 60s, Christina “Tiny” Hardcastle and her husband Frank are the perfect power couple. He’s got his sights set on a political career until three unwelcome guests appear at the family estate on Cape Cod and threaten to unravel their ordered life. A fun beach read! Six sisters gather at their childhood home, having been told of the death of their beloved adopted father. He leaves each of them a mysterious clue as to their true heritage. For those who love a saga this is the first of seven books! A morally complex thriller set in Cuba and Ybor City Florida during the 1940’s. A former crime kingpin is enjoying the fruits of his past labor until his dark past catches up with him. This novel takes you into the troubled relationship between artist Vanessa Bell and her sister Virginia Woolf. I found it fascinating to read about the famous Bloomsbury Group that they started. This debut spy thriller grabs you from the first sentence and won’t let you out of its grip. Absolutely the best suspense novel I’ve read in years! It’s a multigenerational family saga, a historical novel, a ghost story and a story about a family’s struggle to connect with each other. Stein wowed me with his insight to what each person is striving for in life – love, acceptance and redemption.